Hi Guys , welcome back to our tricks portal. Its Sunday and Amazon India Comes Back With Another App Only Quiz , This Time Prize is Big & Quiz is Simple , You Will Get The Free 6 Months Shopping From Amazon. Amazon India is Regularly Arranging The Similar Types Of Quiz & Treasure Hunts , We Are Regularly Posting All The Answers Of Amazon App Quiz Time Quiz. 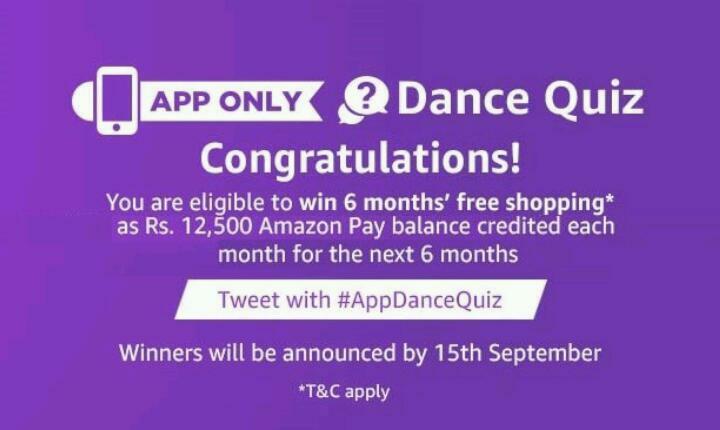 Now in This Amazon Dance Quiz There Will Be Total 1 Winner & The declared winner will be eligible to win Rs. 12,500 credited monthly for 6 months , a total sum of Rs. 75,000 credited over a period of 6 months in parts of Rs. 12,500 each. Why not you may win this time! Simply select The Correct Answers as Given Below! Now You Are Eligible To Win Free 6 Month Shopping From Amazon. You Will See Congratulations Banner !! 1. This Contest will commence on 27th August from 12:00:01 a.m. (IST) to 27th August 11:59:00 p.m. (IST) (“Contest Period”). 5. The draw of lots will be carried out during the Contest Period for the questions and a total of 1 (one) participant will be selected as winners by a random draw of lots. A total of 1 (one) participant will be selected as winners of the Contest. 6. The declared winner(s) will be eligible to win Rs. 12,500 credited monthly for 6 months, i.e. a total sum of Rs. 75,000 credited over a period of 6 months in parts of Rs. 12,500 each (hereinafter referred to as “Prize(s)”), which will reflect in the winner’s Amazon.in account as Amazon Pay Balance.